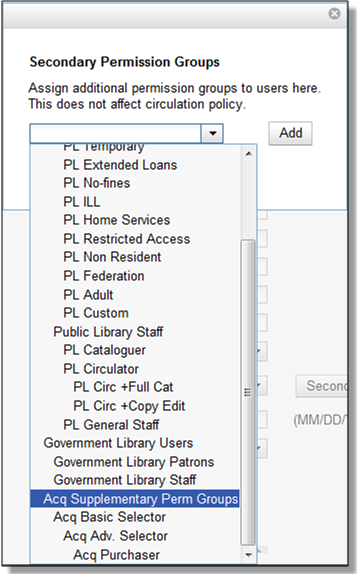 Main permission groups are granted in the staff client through Edit in the patron record using the Main (Profile) Permission Group field. Additional permission groups can be granted using secondary permission groups. 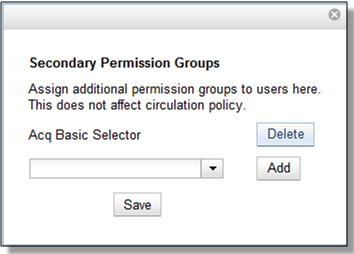 The Secondary Groups button functionality enables supplemental permission groups to be added to staff accounts. 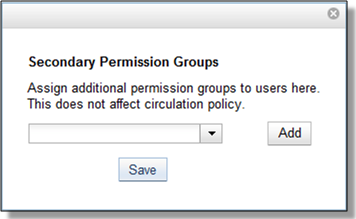 The CREATE_USER_GROUP_LINK and REMOVE_USER_GROUP_LINK permissions are required to display and use this feature. In general when creating a secondary permission group do not grant the permission to login to Evergreen. Open the account of the user you wish to grant secondary permission group to. 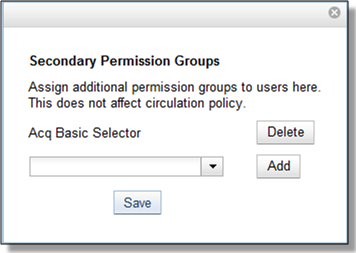 Click Secondary Groups, located to the right of the Main (Profile) Permission Group. From the dropdown menu select one of the secondary permission groups. Click Save in the top right hand corner of the Edit Screen to save the user’s account. Open the account of the user you wish to remove the secondary permission group from. Click Delete beside the permission group you would like to remove.